Peak Oil: What Does It Mean to You? Does oil priced at over $140 per barrel signal the arrival of Peak Oil? The experts disagree on the cause of the price jump but agree on one message: The era of easy oil is over. We began seeing oil prices climb in 1995, rising with even greater momentum in the past couple of years. There was general concern when the historic US$100 per barrel mark was reached, widespread worry when we hit US$120 and serious consternation with the recent climb to US$145. The explanations about what is going on with the price of oil are diverse, complex and downright confusing. Blame the weak dollar, OPEC’s modest increases in production, or that some countries are hoarding supplies. Say there are shortages of refining capacity, or that it’s due to the attacks on pipelines in Nigeria and on tankers in the Gulf. Top it off with the fundamental fact that demand is growing, as more and more people in China, India and the rest of the world begin wanting to benefit from the oil economy. The market is reading these signals and reacting. At the same time, there has been some finger pointing and suggestions that the prices are deliberately being kept artificially high and that someone, somewhere is making a lot of money. Also, looming in the background, just behind the headlines, are much deeper concerns about the possibility of oil production having peaked. In September 2006, the BBC website posed the question “Has oil production finally peaked?” and in November 2007 the Wall Street Journal talked of the limit looming on production. The argument is not that oil is running out right now, but that it is getting harder and more expensive to increase the levels of production beyond the current 85 million barrels per day. There is no reason to panic just yet, but fundamentally we need to understand the long term trends. When discussing oil prices, many analysts like to provide a long term overview of the changes, going back to the oil shocks in the 1970s. One example is a BP/Bloomberg review of how crude oil prices have changed in the period of 1970 to 2008. In this analysis, we see the impact of a number of major events on oil prices, such as the Gulf War, 9/11, the Iraq War and the Lebanon Conflict. Violent struggle and terrorism in the Middle East and in the rest of the world are correlated with surging oil prices. However, the advent of US$140 per barrel does not yet appear to be linked to a particular event. Other analysts point to the need to consider inflation when looking at oil prices, to get things into proper perspective. Yes, prices are high they say, but if you compare them with those of the past and factor in inflation, then the highest prices recorded were in December 1979. In fact, this no longer holds true, for in April 2008 we crossed the US$120 mark and by the end of June the price was over US$140. Nevertheless, this line of argument has been important in calming concerns. There are a growing number of people who believe that we have either reached, are to close to, or will approach in the next few years, the peak of oil production. The Internet is full of websites dealing with the peaking of oil and gas, and many organize around the Association for the Study of Peak Oil and Gas. Peak Oil is not new. The idea has been around since the 1970s, when Dr. M. King Hubbert made his predictions about the peaking of oil production in the US. There is a 1976 clip on YouTube where he outlines his surprisingly accurate predictions. What the Peak Oil community of scientists have done is apply the same methodology for the global supply of oil. The debate around the methodology, the data and the results has been intense and there is no consensus. In April 2007, Worldoil.com presented a summary of recent forecasts of when world oil production could peak. In a well-researched article, they argued that recent estimates range from “2005 to an apparent denial that it will ever happen.” They grouped the forecasts into three ranges: now to 2012, 2012 to 2022, and beyond 2022. They concluded that prudent risk minimization requires that mitigation measures are implemented around 20 years before peaking. Further, in an era where easy, cheap oil is no longer a safe bet, the only way to maintain production levels is through significant investments in oil production facilities across the world. The shortcomings of predicting Peak Oil are highlighted by US-based Cambridge Energy Research Associates (CERA), who argue that as a “theory”, it is faulty, and could distort policy decisions and the energy debate. Their analysis indicates that the the Earth’s combined oil resources are 3.74 trillion barrels—three times larger than the 1.2 trillion barrels estimated by the proponents of Peak Oil. Based on this assessment, CERA argues that rather than a peak followed by a sudden, exponential decline, we are likely to see an undulating plateau/very gradual decline from around 2030, as technology and higher prices combine to facilitate the exploitation of both conventional and unconventional oil (oil shale in Canada, for instance). Comfortably reassuring for many. What is really lacking here, however, is a rigorous debate between these divergent groups and the sharing of data, methodologies and expertise in order to refine the forecasts and guide policies. This in turn adds to the uncertainty and to procrastination in policy circles. Who should we believe? 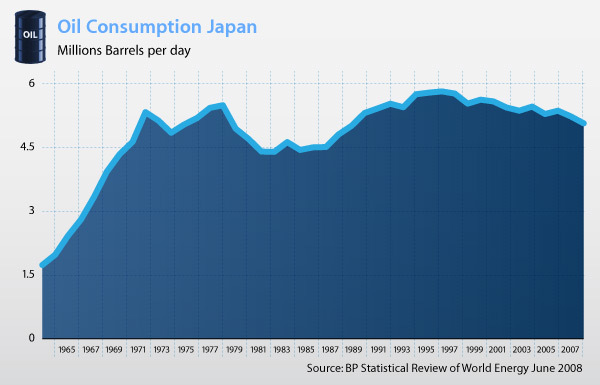 Japan is the third biggest importer of oil in the world (after the US and China). The recent spike in oil prices resulted in political tension in the National Diet (parliament) this year over whether to extend the temporarily heightened rate of tax on gasoline. Many politicians favoured reducing the tax burden, and reducing the price at the pump. 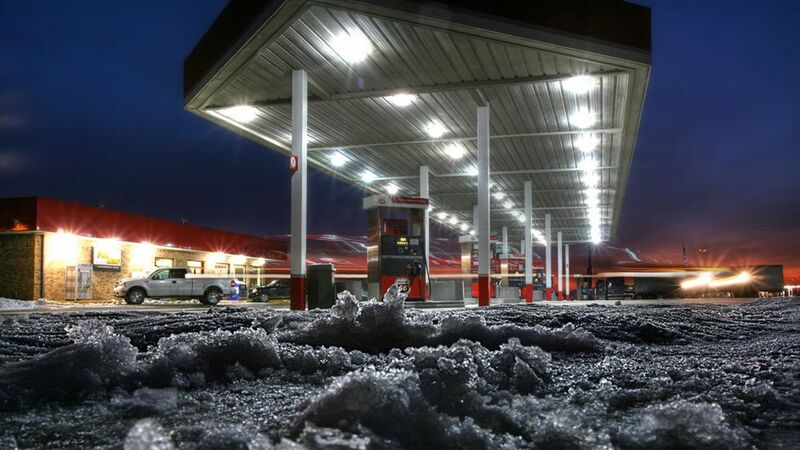 Others raised concerns about encouraging gasoline consumption through tax cuts, while at the same time trying to strongly push for reduction of greenhouse emissions. The leaders in Japan are acutely aware of the situation they face. A large part of Japan’s approach to oil since the 1970 oil shocks has been to maintain imports at around 5 million barrels a day. This is a quite remarkable achievement, when you consider that during the same period oil imports to the US have almost tripled. This has led some to comment that Japan has effectively decoupled oil consumption from economic growth. In other words, Japan has been using oil with increased efficiency and has also been diversifying its basic energy production, particular with the growth of nuclear energy and the extensive use of liquified natural gas. Nevertheless, Japan is still heavily dependent upon oil, mainly in the transportation and industrial sectors. So as prices rise globally, Japan has to pay more on the international marketplace to guarantee those 5 million barrels per day. At the same time, in order to secure supplies in an ever more competitive market place, Japan invests considerable resources in the oil producing countries of the world. In the Japanese context, however, the discussions on peak oil have been limited. There is widespread understanding in policy circles, but limited coverage in the media. There is a lot happening, as we will document later, in the auto industry (new hybrids, electric and hydrogen cars), in the energy sector with the growth of renewables, and the gradual introduction of biofuels. We will only know for sure about Peak Oil after it has happened. The point here, however, is to not panic but to better inform yourself about the underlying causes of the price increases and to prepare yourself. This could cover a whole range of very small changes: leaving the car at home, car pooling, taking public transport, buying a bike, to some bigger changes, like buying a hybrid (or one of those nice plug-in hybrids when they come on sale). The worse thing you can do is to sit around and do nothing. Get online and start reading about these topics. Find out more, talk to people and starting thinking about the things that you need to do, that your family can do, that your community can start doing, how your city can change and how your country will have to change. It is all about being informed, being prepared and making wise decisions. With every day that passes, we learn more about what is going on and we find a way forward. There are lots of clever people looking for answers and finding solutions. You are one of them. Peak Oil: What does it mean to you? by Brendan Barrett is licensed under a Creative Commons Attribution-NonCommercial 3.0 Unported License.